SET (4) 19x9 19x10 CADILLAC CTS-V COUPE SATIN BLACK WHEELS. FACTORY OEM SET OF WHEELS AND TIRES. ORIGINAL (OEM) FACTORY WHEELS AND TIRES. THESE ARE FACTORY ORIGINAL GM FORGED ALUMINUM WHEELS. 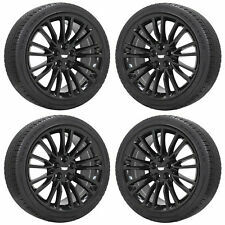 SET of (4) : CADILLAC CT6 GLOSS BLACK WHEELS. 2016-2018 CT6 MODELS. 2016-2019 ALL CT6 MODELS. 2013-2016 ALL XTS MODELS. FACTORY OEM SET OF WHEELS AND TIRES. FACTORY ORIGINAL (OEM). COMPLETE WHEEL AND TIRE SET. 19x8 19x9 CADILLAC ATS COUPE NEW WHEELS. FITS: 2013-2019 ALL ATS MODELS. FACTORY OEM SET OF WHEELS AND TIRES. ORIGINAL (OEM) FACTORY WHEELS AND TIRES. 225/35/19 255/30/19 BRIDGESTONE POTENZA RE050A 91Y NEW TAKE-OFF TIRES. FITS: 2013-2019 ALL CT6 AND XTS MODELS. What is PVD. PVD Process. PVD Warranty. 245/40/20 GOODYEAR TOURING SPORT 95W USED TIRES - 7.5/32nds. PREMIUM ALL-SEASON TOURING SPORT TIRES. ORIGINAL OEM GM WHEELS. Quantity : 1 (Set of 4 Wheels & Tires). TPMS Compatible: Yes. Offset: F 25 R 25. Bolt Pattern: 6x139.7. 2017-2019 ALL XT5 MODELS. 2011-2016 ALL XT5 MODELS. What is PVD. PVD Process. PVD Warranty. FACTORY ORIGINAL (OEM). COMPLETE WHEEL AND TIRE SET. THIS SET FITS. 2017-2019 CT6. 2016-2019 ALL CT6 MODELS. 2013-2019 ALL XTS MODELS. What is PVD. PVD Process. PVD Warranty. 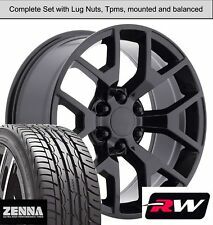 SET of (4) : 245/40/20 95V BRIDGESTONE POTENZA RE97AS TIRES. FACTORY ORIGINAL (OEM). SET (4) 22" CADILLAC ESCALADE PLATINUM BLACK WHEELS. FITS: 2007-2019 ALL ESCALADE MODELS. ORIGINAL (OEM) CADILLAC WHEELS. FACTORY OEM SET OF WHEELS AND TIRES. ORIGINAL (OEM) FACTORY WHEELS AND TIRES. FITS: ONLY XT4 MODELS. ORIGINAL OEM CADILLAC WHEELS. 245/45/20 FIRESTONE FIREHAWK AS 103V NEW TIRES. PREMIUM ALL-SEASON TOURING SPORT TIRES. OEM WHEELS + TIRES + TPMS SENSORS INCLUDED !!!!!!!! SET (4) 22x9 CADILLAC ESCALADE PLATINUM BLACK WHEELS. FITS: 2007-2018 ALL ESCALADE MODELS. FACTORY OEM SET OF WHEELS AND TIRES. ORIGINAL (OEM) FACTORY WHEELS AND TIRES. 285/45/22 PIRELLI SCORPION VERDE 114H NEW TIRES. FITS: 2013-2019 ALL ATS SEDAN MODELS. What is PVD. PVD Process. PVD Warranty. 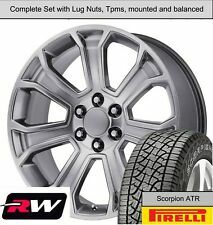 245/35/19 BRIDGESTONE POTENZA S001 99V NEW TAKE-OFF TIRES - 100% TREAD. PREMIUM PERFORMANCE TOURING TIRES. These will fit all Cadillac/Chevrolet/GMC Escalade and 1500 trucks from 2007-2018 model years. 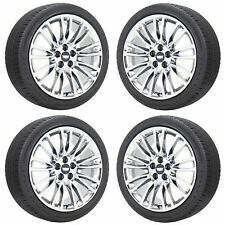 P285/45R22 Bridgestone Alenza Dueler H/L 110H new tires. Genuine GM OE wheels. complete set of. NOT a replica set, these are. Make: Bridgestone. Cadillac Escalade. Chevy Tahoe. 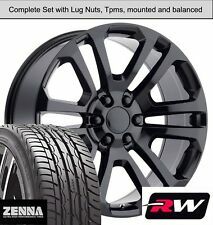 Wheels will fit 6 lug Chevrolet, GMC, Cadillac Trucks and SUV's. Chevy Suburban. Chevy Silverado 1500. GMC Sierra 1500. Wheels and tires are factory OEM with 95% life left. Cadillac Escalade 2004 and above. Tire size: 295/35/24 or 305/35/24. Quantity 1 = 4 wheels Mounted & balanced with tires and FREE lugs/locks. Size: 24"x10". Warranty Info Our Service. FITS: 2017-2019 ALL XT5 MODELS. What is PVD. PVD Process. PVD Warranty. PREMIUM ALL-SEASON SUV TIRES. ORIGINAL OEM GM WHEELS. Quantity : 4. TPMS Compatible: Yes. Offset: F 25 R 25. Bolt Pattern: 6x139.7. What is PVD. PVD Process. PVD Warranty. -WE INSTALLED THE PROPER TIRE SIZE FOR THE 2014-2019 CTS SEDAN MODELS. FITS: 2014-2019 ALL CTS SEDAN MODELS - EXCEPT CTS-V MODELS. 255/35/19 FEDERAL EVOLUZION ST-1 96Y NEW TIRES. These Wheels Are Perfect For Cadillac Escalade Ext Exv Chevy Silverado Tahoe Suburban 1500 Tahoe GMC Canyon Sierra Denali Yukon 6 Lug 6X139.7. oem replicas3015. No TPMS Included, your current set can transfer over or we can quote you a price on a new set installed. Matte Black/Dark Tinted Machined Finish (DDT Finish). DUB Baller Wheels. 24x10 6x5.5/6x139.7 Bolt Pattern 31 Offset. We are an authorized DUB and Atturo Dealer. 285/40-24 Atturo AZ800 Tires. They do not include lug nuts or any other needed hardware. 24X10 Cadillac Escalade Wheels. Will fit on Cadillac Escalade, all 6Lug GMC AND CHEVY Bolt patterns. FREE Mounting & Balancing. 305/35R24 or 295/35R24. In addition to quality certification, all wheels we manufacture endures. Unmarked boxes that do not identify the contents as well as protective rings ensures that your wheels will arrive safely, securely, and anonymously. TPMS sensors INCLUDED! Cadillac Escalade 2004 and above. Quantity 1 = 4 wheels Mounted & balanced with tires and FREE lugs/locks. Size: 24"x10". Tire size: 295/35/24 or 305/35/24. Warranty Info Our Service. Would also fit all years of the XTS as a straight bolt-on. Original OEM/Factory Cadillac CTS 19" Wheels & Tires. A few minor marks associated with normal use so utilize the "zoom" feature if it is important for you to see, but nothing major and no curbing. SET (4) 22" CADILLAC ESCALADE BLACK WHEELS. FITS: 2007-2019 ALL ESCALADE MODELS. FACTORY OEM SET OF WHEELS AND TIRES. ORIGINAL (OEM) FACTORY WHEELS AND TIRES. 285/45/22 PIRELLI SCORPION VERDE 114H NEW TIRES. These Wheels Are Perfect For Cadillac Escalade Ext Exv Chevy Silverado Tahoe Suburban 1500 Tahoe GMC Canyon Sierra Denali Yukon 6 Lug 6X139.7. Quantity: 1 (Set of 4 Wheels & Tires). TPMS Compatible: Yes. 2016-2019 ALL CT6 MODELS. 2013-2019 XTS. 2013-2019 ALL XTS MODELS. SET of (4) : 245/45/19 98V GOODYEAR EAGLE TOURING TIRES. FACTORY ORIGINAL (OEM). NOTE : IN MANY CASES YOUR ORDER WILL ARRIVE BEFORE THE STATED DATE. Hollander #: 4741. TPMS sensors included! These are in like new condition! Size: 22x9. Bridgestone Dueler HL Alenza. These will work on several generations of the Cadillac Escalade family, Chevrolet Tahoe and Silverado, GMC Sierra and Yukon . This Cadillac CTS-V 19" Wheel is a Super Alloyed Satin Black in 10 (ten) V Spoke Design in 9.0JX19" in the front and 10.0JX19" in the Rear. The wheels will fit all Cadillac CTS-V and CTS Sedan from 2009 to 2017. 2016 Cadillac Escalade 22" Factory Wheels & Bridgestone Dueler H/L Alenza P285/45R22. These wheels and tires were removed from an 2016 Cadillac Escalade with less than 2000 miles, so they're in like excellent condition. What is PVD. PVD Process. PVD Warranty. FITS: 2007-2019 ALL ESCALADE MODELS. ORIGINAL OEM GM ACCESSORY WHEELS. 285/45/22 PIRELLI SCORPION VERDE 114H NEW TIRES. PREMIUM ALL-SEASON SUV TIRES. LET US KNOW WHICH INSERTS YOU WANT WITH THESE WHEELS?. The finish of the rims is Glossy Black with CNC Accents. 24" Lexani Wraith wheels & tires - Cadillac Escalade Chevy Tahoe Suburban GMC Yukon - Glossy Black. Chevy: (2001 and up) Tahoe, Suburban. Cadillac: (2001 and up) Escalade. These Wheels Are Perfect For Cadillac Escalade Ext Exv Chevy Silverado Tahoe Suburban 1500 Tahoe GMC Canyon Sierra Denali Yukon 6 Lug 6X139.7. Satin Black With Gloss Black Inserts. No TPMS Included, your current set can transfer over or we can quote you a price on a new set installed. What is PVD. PVD Process. PVD Warranty. 2014-2019 ALL CTS MODELS. SET of (4) : 255/35/19 96H PIRELLI CINTURATO P7 TIRES. FACTORY ORIGINAL (OEM). COMPLETE WHEEL AND TIRE SET. THIS SET FITS. 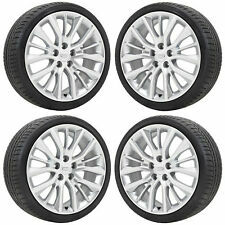 SET (4) 19x8 CADILLAC ATS SEDAN BLACK WHEELS. FITS: 2013-2019 ALL ATS SEDAN MODELS. FACTORY OEM SET OF WHEELS AND TIRES. ORIGINAL (OEM) FACTORY WHEELS AND TIRES. 235/35/19 SUNFULL SF888 91W NEW TIRES. SET (4) 20x8.5 CADILLAC ESCALADE WHEELS. FITS: 2007-2018 ALL CADILLAC 1500 MODELS. FACTORY OEM SET OF WHEELS AND TIRES. ORIGINAL (OEM) FACTORY WHEELS AND TIRES. 275/55/20 GOODYEAR EAGLE LS2 111S NEW TIRES. What is PVD. PVD Process. PVD Warranty. FITS: 2014-2019 ALL CTS SEDAN MODELS - EXCEPT CTS-V MODELS. 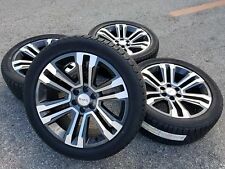 THESE ARE CADILLAC CT6 ORIGINAL WHEELS, THESE WHEELS ARE THE. ORIGINAL OEM GM WHEELS. 245/40/18 NEXEN NPRIZ AH8 93V NEW TIRES. Cadillac Escalade 2004 and above. Quantity 1 = 4 wheels Mounted & balanced with tires. Tire size: 285/45/22, 305/40/22 or 305/45/22 high performance tires. Size: 22"x9". Our Service Chevy Tahoe Silverado Suburban Avalanche. 22X9.0 Wheels fit Cadillac Escalade. Will fit on Cadillac Escalade, all 6Lug GMC AND CHEVY Bolt patterns. Lexani OR Lionhart. WILL FIT: CHEVY TAHOE SUBURBAN SILVERADO GMC YUKON SIERRA YUKON XL CADILLAC ESCALADE AND EXT INFINITI NISSAN TITAN ARMADA. The images, however, may not be indicative of the actual product. 100% NO CREDIT NEEDED GOOD BAD OR NO CREDIT NO PROBLEM. 22" 2017 Cadillac Escalade Rims. 2016-2019 ALL CT6 MODELS. 2013-2016 XTS. 2013-2019 ALL XTS MODELS. FACTORY ORIGINAL (OEM). NOTE : IN MANY CASES YOUR ORDER WILL ARRIVE BEFORE THE STATED DATE. READY TO BOLT ON YOUR CAR. LET US KNOW WHAT MODEL/YEAR THESE ARE GOING ON FOR CORRECT TPMS SENSORS. Does NOT fit vehicles equipped with upgraded or performance brakes such as Brembo. Center Cap: Chevy, GMC, (If you don’t specify you get plain ). Product has not had a tire mounted on it, has not been installed or used in any other way.